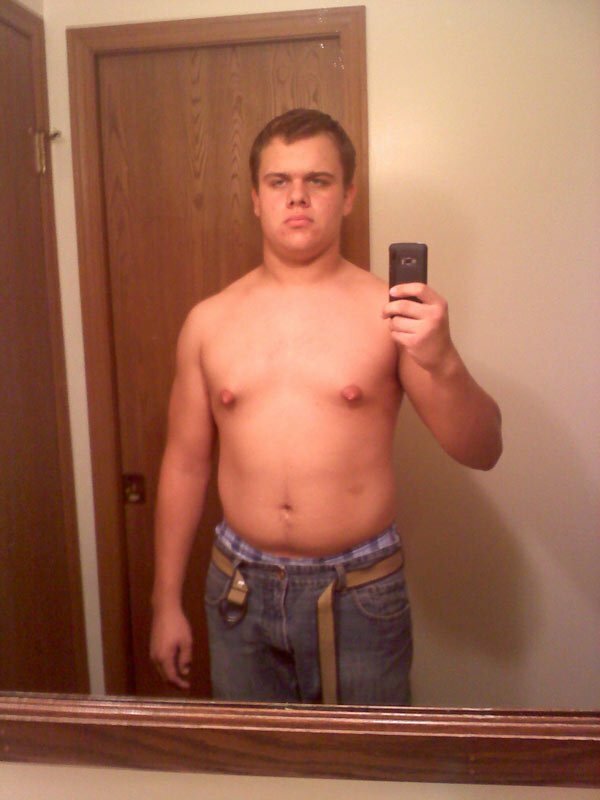 David always knew he wanted to lose his football bulk eventually. When he injured himself he chose to take it as an opportunity to reinvent himself. See how he did it! In high school I played football for a town in Ohio called Boardman and I was a strong lineman at 225 pounds and placing in area lifting meets. 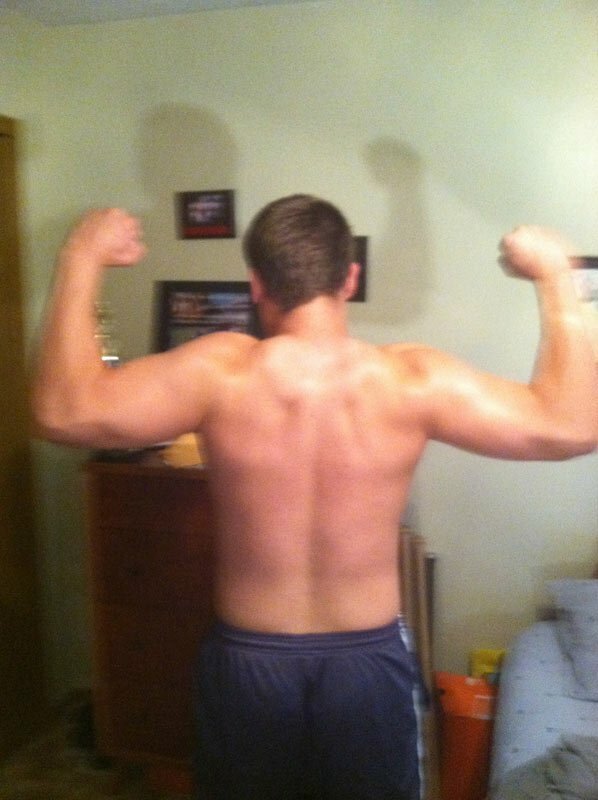 I was strong, yet I had some unsightly body fat I wanted to get rid of since middle school. 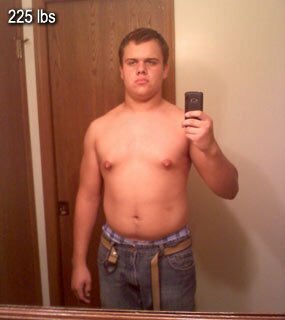 I was also always self-conscious of taking my shirt off to go swim with friends and I wanted to lose weight so I could feel better about the way I looked. 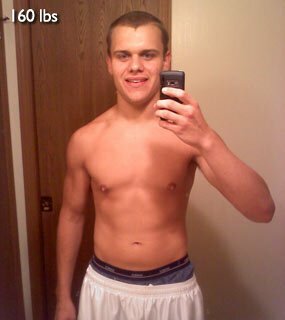 I would have started this plan to lose weight earlier, but I loved being a lineman so much, and I would have to change positions if I weighed any less, so years in advance I planned to lose a majority of my excess body fat after my senior football season. Unfortunately, I got an early start on my diet. During week 5 of the season, I broke my leg and was done for good and had a chance to being named first team all league. As soon as the doctor told me I would be missing the rest of my games I decided to start changing my bad eating habits and the ball kept rolling from there. Signed rock in the background, chiseled physique in the foreground. I first started cutting back on the amount of fast food I ate. I work at my high school job, Taco Bell, so it is hard to stay away from fast-food completely for me. Instead of eating there I started packing my own lunch and dinners. If I did decide to eat at the store I would eat the lower calorie items like salads and gorditas. From my dieting I now basically know the calorie and protein content of every Taco Bell food item. I also started just cutting back on portion sizes when my mom cooks dinner. I stopped going up for seconds and even began to measure portion sizes with a digital scale. I also started dividing my food up into 5-6 smaller meals instead to 3 big ones. I also used the Lose it! App for the iPhone to track how many calories I ate in a day and how much protein and carbs I was consuming. 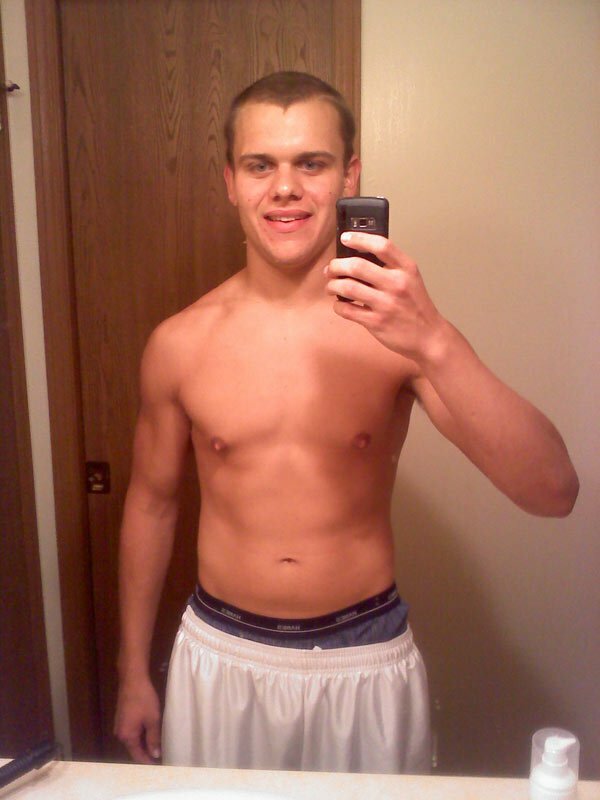 I continued what I learned from playing Boardman Football on how to exercise. I lift 4 days per week and do 4 days of cardio. I mix it up between steady rate jogging and high intensity interval training, running 110s and 350s on the high school track. 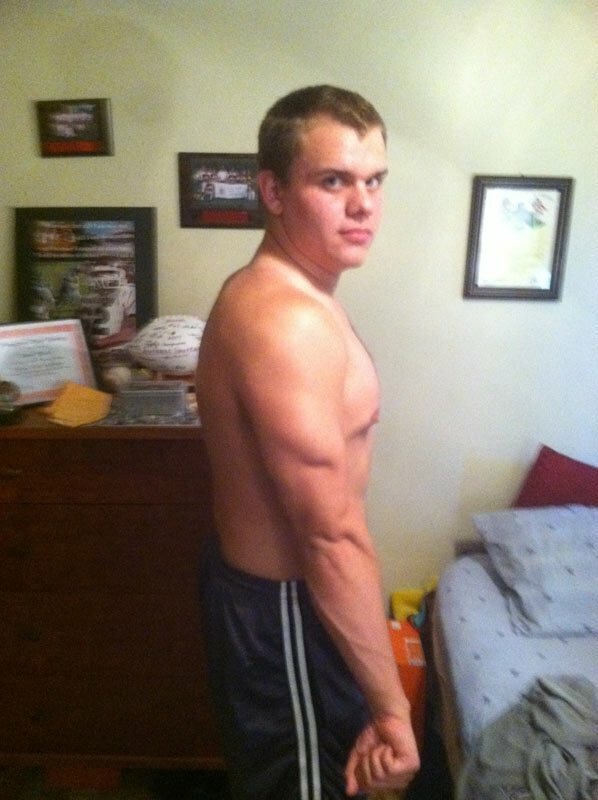 I learned how to properly lift and run thanks to my 4 years of playing football. We lifted 4 days per week there and did sprints during the summer. 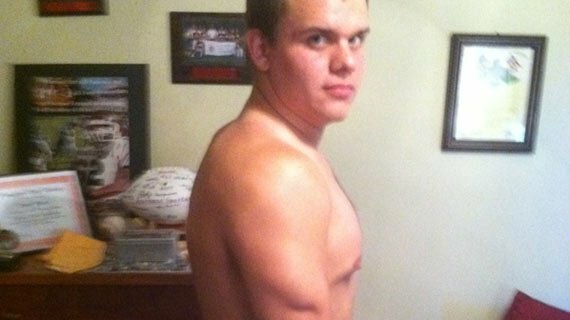 Thinking of the values that I learned from my football coaches kept me motivated to lose the weight. They taught me to never give up, get through workouts, and dedication. I was also self-motivated at the reward of looking better and feeling better about myself. My metal head music helps me power through workouts and it motivates me to accomplish my goals. I have a set of goals posted above my laptop in my room that I want to accomplish in bodybuilding and school. This reminded me every day what I set out for myself to do. What kept and still keeps me going are all the compliments I received from all my friends, family, and co-workers on how good I looked. Some couldn't believe it was me and I lost all that weight. Some people I haven't seen in a while didn't even recognize me at my graduation party. 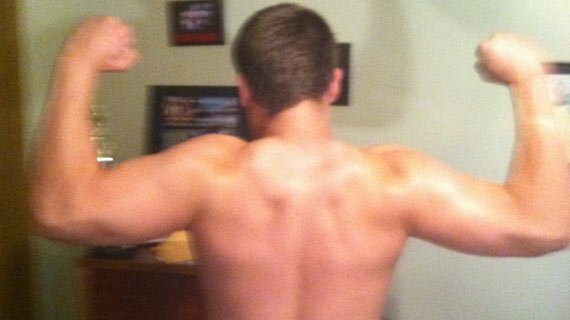 Lats that could blot the sun … if he were outdoors. Set goals in your life, find whatever motivates you, and get it done.